Noise-induced hearing loss is completely preventable, yet five million kids in the United States suffer with this condition, and more are diagnosed every year. Make sure your child isn’t one of them, and use these tips to teach your children how to protect their hearing while they’re at school. Kids often use their time on the bus to listen to music or play games on portable electronic devices. It is tempting to raise the volume to unsafe levels in order to hear the music over the noise from the bus. If your child is using headphones on the bus, talk to them about acceptable volume levels. Or even better, invest in a pair of volume-limiting headphones so they can’t turn up the volume above safe levels. Music lessons are often among children’s favorite classes, but long and frequent exposure to loud music can lead to noise-induced hearing loss. Drums and wind instruments such as trumpets and tubas can damage the hearing of the player as well as those near them. 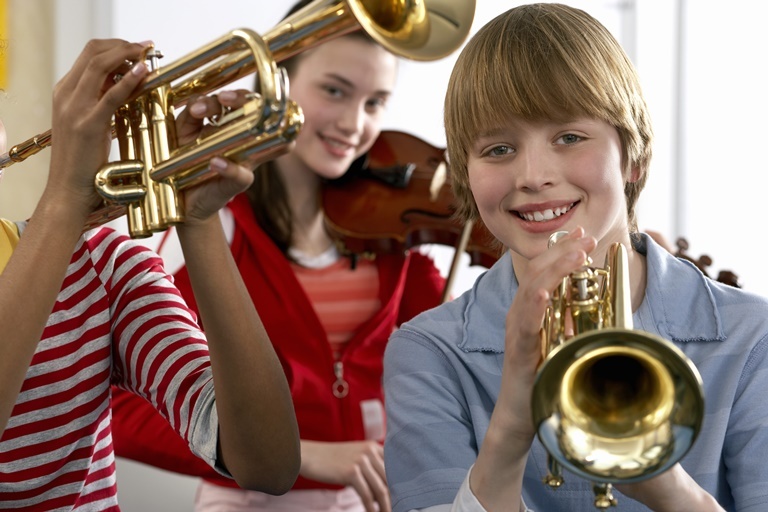 If your child plays in the school band, talk to the music teacher about how to protect the kids’ ears during rehearsal. Is hearing protection needed? Is it provided? You can also talk to a pediatric aud​iologist about custom hearing protection for your child so they can enjoy their musical talents without compromising their hearing. While your child is on the playground, they may be exposed to excessive noise from traffic, sirens, train whistles and nearby construction. Visit the playground during recess to hear the noise for yourself, and if you have concerns, bring them up with the school’s administration. Advise your child to move away from noise that hurts their ears, like sirens or loud whistles. Sports programs promote fitness, teamwork and foster social relationships. Any school sports program should provide proper protection for children’s ears. Baseball and softball players should be equipped with helmets to protect their ears and temples, and wrestlers should all have ear guards. At the end of the day, you will be the best role model for good hearing health for your children. Be sure to wear hearing protection when mowing the lawn or using loud tools such as chainsaws or drills. Keep the volume of the television and stereo at normal levels, and have your hearing tested regularly. Teach your children the importance of hearing conservation, and set them up for a lifetime of good hearing.